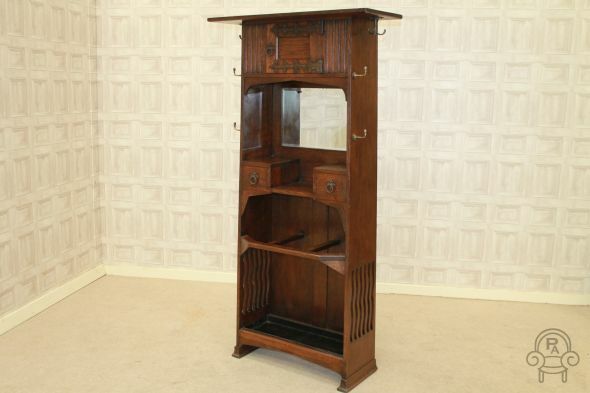 An attractive arts and crafts oak hall stand by Liberty and Co circa 1900. This is a beautiful piece of quality English oak furniture as illustrated in the Liberty and Co catalogue ‘furniture for towns, flats and country houses 1902’. This well proportioned item is in lovely condition for its age; with all its original hooks, still remains its original drip tray. There are minor pieces of wear and tear to this item but unfortunately there is no Liberty and Co label. The key is missing for the top cupboard and there is a small amount of foxing to mirror, however as you can appreciate this piece is more than 100 years old. This unique piece of furniture would be ideal for a collector, or a beautiful statement piece to enhance any large hallway.